USA Mobile Drug Testing prospective franchise owners should, in the opinion of UnhappyFranchisee.Com, proceed with extreme care, do extra due diligence, and speak to as many current and former franchisees as possible before investing in this franchise. “Just get in your vehicle and make money,” says the USA Mobile Drug Testing franchise website. The USAMDT states that its location in CT had annual sales of $333,000, with an impressive income of $155, 000 after expenses. USA Mobile Drug Testing CEO Joe Strom claims that USAMDT has grown from 11 franchises in 2010 to 77 franchises in 2011 to an impressive 93 franchises in 2012. However, the franchisees who contacted us tell another story entirely. The franchisor’s responses to our questions are evasive and seem fishy. And, bottom line, the numbers just don’t add up. How many franchises does USA Mobile Drug Testing have? Simple question, right? We can’t seem to get a straight answer as to how many franchises USAMDT has up and operating. When we wrote our first post on USAMDT, we reacted to the company’s listing on Entrepreneur.Com, which indicated that the number of USAMDT franchises had dropped from 77 in 2011 to 52 in 2012 – a decline of 25 franchises. 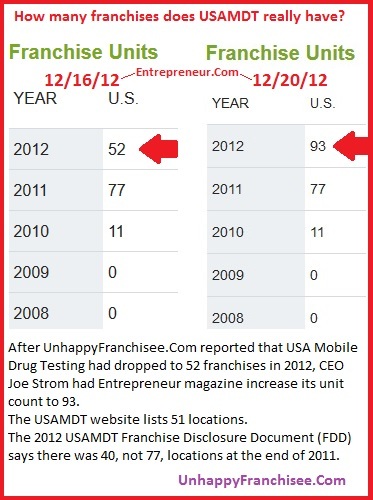 CEO Joe Strom then told us that our data was incorrect, and directed us back to the same page on Entrepreneur.Com which suddenly states that USAMDT has 93 franchises – a gain of 16 franchises over 2011. So we went to the USAMDT website and manually added up the locations listed. There are 51 locations listed on the USA Mobile Drug Testing website. Of those 51 locations, 8 locations list the corporate phone number (855-USA-TEST), not a local number, indicating that there may be as few as 43 franchises. Confidential sources indicate that number may be dropping soon, as a numerous franchisees are planning to either close or leave the system in the coming months. Additionally, USAMDT’s own Franchise Disclosure Document (FDD) seems to contradict Joe Strom’s assertion that there were 77 franchises at the end of 2011. The FDD states there were 40 USAMDT franchises at the end of 2011, not 77. We have once again asked CEO Joe Strom for some corroboration that there are 93 USAMDT franchises, and that the system grew by 16 rather than declined by 25 franchises. USAMDT has one of the most questionable Financial Performance Representations we’ve ever seen. The 2012 USAMDT Franchise Disclosure Document (FDD) contains what we believe is one the most misleading earnings claims (Financial Performance Representations) that we’ve ever seen. It claims A & B Employer Solutions, Inc. had yearly sales of $329,225.40 and “income” after expenses of $155,039.10. – A & B Employer Solutions, Inc. was an established business selling drug testing services to an existing customer base – an advantage new franchises would not have. – A & B Employer Solutions, Inc. was restricted to a local territory, but may have sold nationally? The $329,225.40 figure may have been derived from a business marketing nationally, not confined to a market like a franchisee would be? Seriously? – The FDD states “We did not have a written franchise agreement with A&B until 2011. However, both A&B and we have treated A&B’s operations as a “franchise” (except that A & B did not pay royalty fees prior to signing a franchise agreement…).” It appears that A&B also did not pay a franchise fee, advertising fund or technology fund fee. Why would A & B Employer Solutions, Inc. severe all ties with USA Mobile Drug Testing unless USAMDT trademarks and services gave them no significant benefit? So USAMDT has no idea whether this Financial Performance Representation contains accurate information or not, but it will provide it to prospective franchisees anyway? Did Joe Strom exploit the Sandy disaster to discourage franchisee lawsuits? Unnamed franchisees claim that USAMDT offered franchise owners affected by Superstorm Sandy a seemingly generous 3-months without royalty payments in order to help them weather the devastation in the Northeast. Seemed like a kind and thoughtful gesture, they said. Franchisee acknowledges that the waiving of three additional monthly Minimum Royalty Fees is of considerable value. For the value received Franchisor and Franchisee, for themselves and their successors, assigns, heirs and personal representative, for good and valuable consideration the receipt of which is hereby acknowledged, release each other and their respected affiliates, officers, directors, shareholders, employees and agents from any and all actions, causes of action, suits, claims, damages, expenses, debts, bills, covenants, contracts, controversies, agreements, promises, judgments, or demands that either of them now has, may have ever had, or may have against the other based on any transaction, event, or circumstance whatsoever relating to the Franchise Agreement through the date of this agreement except for the terms and conditions specifically agreed to in this agreement and any claims for which Franchisor would have the right to indemnification or contribution under the terms of the Franchise Agreement arising out of the Franchisee’s operation of the franchise. So, Joe Strom had such compassion for franchisees devastated by Hurricane Sandy that he was willing to give them 3 months worth of royalties… as long as they signed a legal agreement forbidding them from suing him for anything the company may have done – or not done – in the past. All created with smoke and mirrors, run for the hills! Has anyone experienced POOR testing procedures with this testing group? 1) Failure to secure “Chain of Custody” with donor signature? 2) Presenting a “NON-Contact POSITIVE” drug test result to the client/employer which would result in the firing of an innocent employee? 3) Sloppy handling of urine sample: temp. gauge on test cup/ failure to seal test cup and label cup with donors full name in the presents of the donor? Please advice as soon as possible. Thank you.